Ron Shaich: Shareholder value is a "narrow definition of success." As a kid in Livingston, N.J., I had no real interest in business. I always thought I wanted to do something in government or social policy. I worked for Congressman Frank Thompson Jr. and on campaigns in Washington, and then went off to Clark University in Worcester, Mass. My sophomore year I was at a local convenience store with some friends. They really didn't want students there, and we were tossed out for supposedly shoplifting. I said to a friend, "The heck with these guys. Why don't we open our own store?" I had been elected treasurer of the student body, and I thought we could raise the money. We opened the beginning of my junior year, and I ran it. It was the most wonderful thing I ever did. For someone who can't dance or sing, it was the closest I ever came to being an artist. The student store became an institution at Clark. I started speaking around the country about student government opening their own stores, and people kept telling me I could probably get into Harvard Business School, so in 1977 I applied and got in. After I graduated, I went to work in Ohio for the Original Cookie Co., a small chain of stores run by Cole National. [It merged with Mrs. Fields Cookies in the 1990s.] I had this idea of opening urban cookie stores and was tempted to go out on my own. I came back to Boston, but no one would lease me any space. I ended up going to work for a Democratic political consultant. I was there a year when a little jewelry store that had two locations in the same block agreed to sublease me 400 square feet. In August 1980, I opened the Cookie Jar. I thought I'd go up one day a week to the store and back to D.C. to run campaigns. One day very quickly became three, which became four. This was mine, and somehow it felt completely different. It was tiny, and I wanted more. 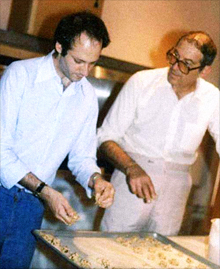 To expand my offerings I became a licensee of a French bakery company, Au Bon Pain, in late 1980 and put in French baked goods (like croissants) at the Cookie Jar in the morning. Au Bon Pain had three stores, and the founder, Louis Kane, was trying to sell the business because it was under so much debt. I remember going to my dad, who was a CPA, and he said, "Ron, if you can get any of it, it's not worth having, and if it's worth having, you're not going to get any of it." But I wanted this desperately. So in 1981 the Cookie Jar and the three debt-laden Au Bon Pains were combined into one company. My father and I got 60% of the company, and Lou and his investors split the remaining 40%. By 1984 I was worried because the French baked goods we sold at our half-a-dozen stores were becoming pedestrianized. We decided to use the croissant and bread as a platform to sell soups, salads, and sandwiches. We opened our first French bakery-café in Boston's Copley Place, and by 1991, the year Morgan Stanley took us public, we had 125 stores. But the very thing that had made Au Bon Pain a success up until that point was the thing that limited it. It was a powerful niche business, working well in big cities. In 1993 I met with a couple of guys who had a 19-store chain called St. Louis Bread Co., which was a lunchtime soup, salad, sandwich place. I was impressed. We knew how to take something from 50 to 1,000, and it was the gateway to the suburban marketplace for Au Bon Pain. We bought it for $23 million, and then didn't change it. For two years we studied it. I was trying to figure out what was going on in consumer society. There had been a huge amount of consolidation in every industry. Every shopping strip and mall was the same. In response there was a drive for specialness. We began to conceptualize St. Louis Bread as a gathering-place business. We created a new physical environment for the café. We started rolling out bagels, breakfast, and a take-home-bread business. In 1998, as we built out St. Louis Bread, we made the decision to change the name to Panera, a word that has roots in "breadbasket" in Latin. By the mid-1990s we were running the company as four divisions: Au Bon Pain, international, manufacturing, and Panera. Meanwhile, the stock had been flat for three years. I realized Panera was the gem, and it was buried. I knew I should sell everything else off and bet the whole thing on Panera. I brought it to the board, and there was a huge disagreement. Au Bon Pain was the namesake. We were selling it all to bet on the little one. It was a painful process. Many of the people I had grown up with at the company were sold off with Au Bon Pain. In 1999 we ended up with a public company with one division, Panera, which had about 180 bakery-cafés and a pristine balance sheet with a bunch of cash. I got on a plane and moved my family to St. Louis. We have come from a continuous process of smart bets like that one. Take antibiotic-free, all-natural chicken. We had it before there was a market for it, so we had to build a manufacturing supply chain. A few years ago I started thinking about how I wanted to have another experience in my life. I wanted to know what it felt like without Panera. In 2010 I handed off the CEO job to Bill Moreton, whom I worked with for 10 years. The idea was I'd spend two to three days a week on Panera on the creative stuff. I'd have time to look into my other interests, like politics. It took me four weeks to realize my continued intellectual interest in Panera. I was liberated to create much more value than I ever could in the existing role of CEO when I was freed from day-to-day details. Bill got it, but we spent hours talking before deciding I would come back as co-CEO. He could have said, "I signed on as CEO. I don't need the founder back." And I could have said, "I'm the largest individual shareholder -- I don't need to be co-CEO." It worked because we both want the same thing for Panera. Now I'm focused on all things that create value through how we compete -- marketing, food. Bill covers all things related to how we operate. 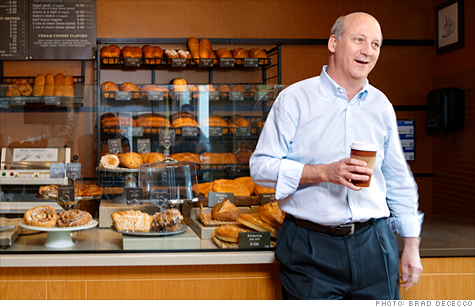 One of the first projects I launched after stepping down as CEO was Panera Cares. Panera has always had a commitment to community. We give $100 million a year in cash and product, but I got this feeling that it was disconnected from us. One day I'm watching NBC News, and it's the height of the recession. I hear about a pay-what-you-can café in Denver. They spent years trying to get this thing open. We open a café every 75 hours. We decided to do the full Panera experience, open a bakery-café identical to any other Panera, and list a suggested donation. We opened our first Panera Cares café in 2010, and just opened our fourth. They'll serve about 1 million people this year. These days I spend a lot of time thinking about how I'd compete with Panera if I weren't Panera. Much of our competitive differentiation will stem from what technology can enable for our customers. We're going to bring that to market. I'm looking at things we didn't get done at Panera my first time around as CEO. I've got a shot to get them done now.? Look beyond the shareholder. We're involved in the conscious-capitalism movement, which is based on this idea that the worst thing that ever happened in corporate America is this obsession with shareholder value. It's a narrow definition of success and is actually dysfunctional. Profit and stock price are not things I can make. They're a byproduct of delivering for all of my constituencies. It's okay to think small. This idea that you have this broad strategy is not always right. See opportunities to make a difference, and that will bring new things down the road. I'm quite convinced that Steve Jobs didn't know he would end up with the iPad when he did the iPod. Don't obsess over the numbers. When I was a young person, I used to be worried about the P&L, and then I realized that what drives the key P&L is getting the right stuff done right -- the key initiatives. That's where I began to focus most of my time. Focus on creating the future. The future doesn't just happen to me. I have to figure out where that organization is going. Businesses are increasingly thinking short term. It's a competitive disadvantage. The important things play out over years, not quarters.